You can be very successful on Social Media without spending a dime, just time. With that said, there are reasons to invest a little budget in channels like Facebook and Instagram to push your message further than it can go organically. We've all heard the saying "Time is Money," and that's true for pretty much any industry. Am I saying that spending money on Facebook will save you time? Yes, and no. Advertising can drive results that would take you much more time to generate through your own activity. But the secret is spending that money effectively to make sure the results are worth it. I would argue the same about time you invest in Social, but today we're focusing specially on Facebook Advertising. Let's talk about how you get started, how in depth you need to go and how you measure results. What are you hoping to achieve? This is one of the most important considerations not only for determining success after the fact, but also how you set up the campaign in the first place. Facebook's tools are specifically tailored to your goal of choice, so be mindful of what you want your audience to do. In the Awareness bucket, you can get more people to see you content and engage with you. As a small business, I don't typically recommend spending very much on Reach alone because it's much harder to translate these results to actual sales. The options under Consideration and Conversion are further down the purchase funnel and more likely to show a clear return. As such, if you only have so much budget, I would spend on specific actions like visits to your website or sales. If you are driving activity on your website, be sure to use the Facebook Pixel to get the best results. You've probably seen the Boost option on your Page, and this is a quick way to set up an Ad. It will usually be an Awareness or Engagement based campaign. These can be successful with even just a few dollars. When you're ready to go down the funnel, go to Ads Manager for the full suite of options. I know there's been quite a lot of negative buzz around the information that Facebook collects about us, but the truth is that this information can be used to your benefit and in an honest way. Thanks to Facebook's technology, you can get very detailed on the people you want to target with your money. No need to spend carelessly. You can outline geography, demographics, interests and more. Just be mindful that you aren't being too specific such that there isn't a larger enough group to reach. Relevance is huge, so you want to go after people who will be interested in what you have to offer, and Facebook makes this possible through different targeting options. Next you get to pick visuals and text to share your message. Depending on your objective, you can use an photo, several images or a video. Be sure you understand Facebook's ad policies though, like the limit on how much text you can include in the image. As an artist, you're lucky because you probably already have a ton of great visuals. The goal is to catch people's attention so they don't scroll past. From there, your text needs to communicate the What and Why: What do you want them to do, i.e. the Call to Action, and Why they should do that. 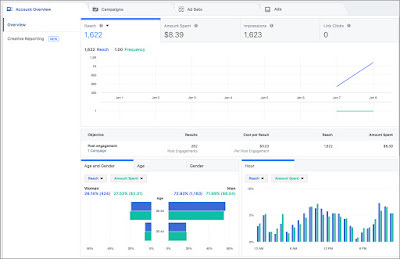 While you can run just one creative to keep things simple, Facebook let's you set up variations and measure the differences to understand what your audience likes best. Check out more on what types of Ads you can run. When you set up a Facebook campaign, you have the opportunity to decide where the ads appear. This will depend some on your objective, but for the most part, you can choose Newsfeed, Righthand column, In Videos, Instagram, Audience Network, and more. They are constantly testing new options to reach the people that matter to your business. If you don't want to pick, you can let Facebook decide for you, one of their many optimization options. Learn More. We could spend several blog posts on how Facebook Ads work, but at the most basic level, they use an ad auction. This means everyone who places an ad targeting the same people will be competing to be shown to those individuals. Facebook's system determines who wins that ad impression every time there is a chance to be seen. How your audience is responding to your ads as well as how much you bid impacts whether or not your ad will be shown. Honestly, the backend of all this is pretty complicated, but the good news is that you don't really have to go into the details. You can let Facebook optimize for you. This is especially true with smaller budgets. There isn't really room to get that in depth so you can just let the system make the most of what you have to spend. Of course, this is why the objective is so important. Make sure you choose a result that will actually matter because that is what Facebook will try to deliver for you. So how much should you spend? One of the beauties of online advertising is the wide range of data you have available to you. Facebook tracks a lot of different steps in the ad cycle to let you know what's working. You can go as deep as you want. At a top level, you should check the results specific to your goal. How much of the chosen activity did you drive? Clicks, Likes, Sales, etc. You can also look at how many people saw your ad and how many took another related action. These metrics can be customized to what matters to your business. They should also be a good reflection of whether or not your budget was well spent. Simple, right? Ok, maybe not, but the good news is that it's easy to learn. Facebook offers the Boost option to quickly create an ad. You'll have most of the same options, but if you're ready to get more in depth, check out Ads Manager. That's where you'll see results for your Boosted posts and where you can create new campaigns. If you'd like a hands on walk through or help setting up your first campaign, let's talk. My years working for Facebook were spent helping people use the Advertising tools to their best advantage, and I'd love to help you do the same.